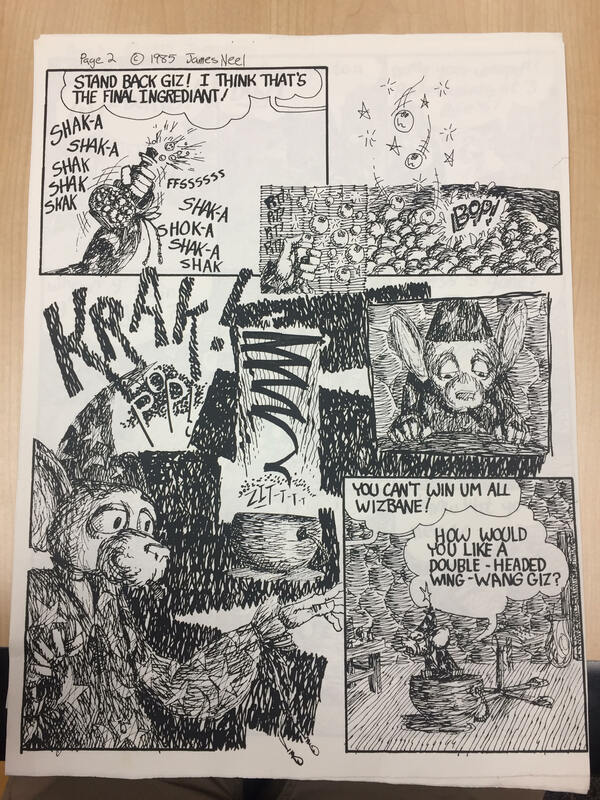 In his comic, The Wishbone, James Neel uses a variety of different design concepts that we have been learning over the course of the semester. The comic is rather short, eight full 8.5″ x 11″ printer pages to be exact, and he published this comic in 1985. This comic stood out to me from the rest of the comics that I looked at during our visit to Manuscripts, Archives, and Special Collections because all of the drawings in the comic are made up of points, lines, and planes, but when you look closely, it just looks like a bunch of lines scribbled together to form shapes. The different shades of lines provide the comic with different visual textures. I believe that the comic was based on the movie, The Gremlins, which was released in 1984, one year prior to the release of this comic. The gremlin also appeared in comic books shortly before this, but Gizmo was one of the gremlins that I remember from the movie and the gremlins were stirring up ingredients in order for their species to multiply. The comic is supposed to be read from top to bottom and left to right similar to a normal page from a book. However, the biggest image on page 2 of the comic is in the bottom left corner, and although that’s probably the first thing that you see when glancing at this page, that is not where the page actually begins. James Neel uses visual hierarchy to tell a narrative by placing the images on the page in the order of their importance and making sure that there is a clear separation between each of the layers on the page. He uses frames around some of the images as well as implied frames around some of the other images. These are all some of the things that have influenced my poster comic. I will be using hierarchy to tell a story from top to bottom and left to right, but there are going to be other images on the page that will catch your eye before reading the beginning of the narrative in the top left corner. I will also be using a variety of different textures while layering different images and text over each other. I also like the idea of implied frames, as well as regular frames around some of the images, so I am going to try and incorporate that into my comic as well.